Despite success in recycling, large amounts of municipal solid wastes (MSW), commonly known as trash or garbage, are generated by homes, businesses, hospitals, schools, and other facilities. This tool describes how municipalities can use modern technologies and practices in the collection, transport, processing and disposal of MSW. According to the U.S. Environmental Protection Agency, in 2010 Americans were responsible for creating approximately 250 million tons of trash and recycled or composted over 85 million tons of this material, equivalent to a 34.1 percent recycling and composting rate. On average, we recycle and compost 1.51 pounds out of our individual waste generation of 4.43 pounds per person per day. While the EPA's statistics found that the generation of MSW peaked in 2000 at 4.72 pounds per person per day, we are still consistently generating well over four pounds per person per day. Waste material must be managed in an environmentally responsible and cost-effective manner. Historically, MSW was typically deposited in landfills or incinerated. Both these methodologies had the potential for damaging the environment due to toxins leaching from landfills or air pollution from incineration. Current disposal technologies have reduced the potential for environmental contamination; modern landfills typically contain liners and other means to prevent environmental damage, and some capture landfill gas to be burned as a fuel to generate electricity. Incineration can also include "waste-to-energy" systems that use MSW to fuel furnaces that generate electricity. However, both these technologies still have the potential to release atmospheric pollutants if not properly controlled. Energy Conservation: MSW programs inherently conserve energy through resource recovery practices including recycling materials such as glass, composting, paper and cardboard, plastic bottles and metal. Economies of Scale: The efficiency of MSW programs can be increased when the volume and number of participants increases; governmental agencies are in the best positions to take advantage of these economies of scale. Greater Recycling Efficiency: Reducing the sorting required by citizens may mean more eligible materials will be recycled, along with greater citizen participation. Reduced Collection Costs: Collection, transport and disposal costs can be reduced through resource recovery and by reducing the amount of waste that is generated at the source by more efficient production processes. Environmental Benefits: Recycling, source reduction and resource recovery reduces the potential for MSW materials to be released into the environment. Cost: The initial administrative and capital costs for the creation and administration of MSW programs, costs for acquiring vehicles to collect recyclable materials, and processing facility upgrades may be significant. Inconvenience: Some MSW management programs can require additional labor to sort recyclable materials, which may affect a business's production schedules. Waste Reduction or Avoidance Practices: Wastes that are not created do not need to be managed. Municipalities can lead by example and adopt methods of waste reduction such as reusing products and equipment and instituting repair programs that extend their service life, thus postponing their replacement, promoting products that are designed to be refillable or reusable (such as fabric instead of plastic shopping bags), and discouraging the use of disposable products such as "throw-away" tableware. "Pay as You Throw" Principle: This model prices the disposal of MSW according to the per-unit amount of waste material, rather than based on a flat rate. This is a market-based approach that discourages waste production by essentially placing a tax on waste materials. This concept is related to bottle-refund or deposit programs. Composting: Composting is a commonly-used means of reducing the volume of organic matter. Some municipalities compost leaf and landscaping materials and offer it to residents as soil amendments. Gasification and Pyrolysis: These are more complex methods of reducing the volume of organic material and converting it to other useful products, whereby organic materials are heated to high temperatures in a relatively-low oxygen environment and under high pressure. Pyrolysis of solid waste can convert the material into solid residue such as charcoal. 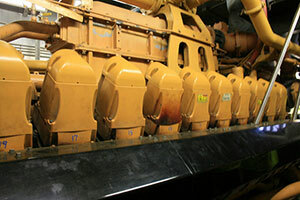 This engine burns landfill gas to generate electricity. Pennsylvania Act 101, the Municipal Waste Planning, Recycling and Waste Reduction Act, was adopted in July, 1988 and mandates recycling in Pennsylvania's municipalities. The Act requires counties to develop municipal waste management plans, and provides for grants to offset expenses. The goals of the Act are to reduce Pennsylvania`s municipal waste generation, recycle at least 25 percent of waste (a goal that has generally been met), procure and use recycled and recyclable materials in state governmental agencies and educate the public about the benefits of recycling and waste reduction. Municipalities with populations of at least 10,000 were required to implement curbside recycling programs by September 26, 1990. Municipalities with populations between 5,000 and 10,000 and more than 300 persons per square mile were required to implement curbside programs by September 26, 1991. Mandated municipalities must collect at last three of the following materials: clear glass, colored glass, plastics, aluminum, steel and bimetallic cans, high grade office paper, corrugated paper and newsprint. Commercial, municipal and institutional establishments within a mandated municipality are required to recycle aluminum, high-grade office paper and corrugated paper in addition to other materials chosen by the municipality. To fully realize the intent of Act 101, municipalities should adopt ordinance provisions for recycling, as either a stand-alone ordinance or as a component of a solid waste chapter of the municipality's code of ordinances. The ordinance language should address the following: applicability of recycling program efforts, materials that can and cannot be recycled, the designation, authorization and reporting requirements for authorized haulers, collection schedules, public information programs, and compliance and enforcement provisions. The ordinance should also include separate provisions for residential and commercial, municipal, and institutional requirements. Municipalities should be aware that grant funds are available for the development of municipal recycling programs. Pocopson Township: Chapter 174, Recycling. West Goshen Township: Chapter 45, Garbage and Recycling. West Whiteland Township: Chapter 264, Solid Waste and Recycling. Willistown Township: Chapter 87 of the Township Code, Article III â€“ Recycling. Section 301(a)(4) of the Pennsylvania Municipalities Planning Code (MPC) states that a municipal, multi-municipal or county comprehensive plan shall include a plan for community facilities and utilities, which may include solid waste management and other similar facilities and uses. Additionally, the MPC states that a plan shall include a statement of the interrelationships among the various plan components, which may include an estimate of the environmental, energy conservation and social consequences on the municipality (Section 301.(a)(4.1)). The U.S. Environmental Protection Agency's Land, Waste, and Cleanup Topics. The Resources Conservation and Recovery Act is the U.S. federal solid waste management law. The Chester County Municipal Solid Waste Plan is available from the Chester County Health Department — Division of Solid Waste Management. The Southeastern Chester County Refuse Authority (SECCRA) website provides general recycling information, along with the location of recycling centers in southern Chester County, and the materials currently being accepted. There are currently 11 drop-off recycling centers in the SECCRA service area, including the SECCRA headquarters in London Grove Township. The Professional Recyclers of Pennsylvania is a nonprofit association of recycling professionals dedicated to promoting and enhancing the interests of recycling, recycling programs, composting, and composting programs in Pennsylvania through education, information exchange, technical support, applied research, and coordination of recycling industry initiatives. The PA Department of Environmental Protection's Recycling Page contains information on the benefits of recycling, recycling center locations, grants, and recycling data.